Inman Gallery presents a solo exhibition of recent work by Los Angeles artist John Sonsini entitled New Paintings. The exhibition opens Friday, January 13 with a reception from 6 to 8 pm. The gallery has previously featured Sonsini’s portraits in the group exhibitions Do I Know You (2010) and ACME. @ Inman (2003). This is the artist’s first solo exhibition in Texas. The eleven oil on canvas paintings on view showcase new developments in Sonsini’s decades-long engagement with painted portraiture. In this latest body of work the artist pictures several of his sitters in fútbol/soccer uniforms. Clothing has always played a prominent role in Sonsini’s paintings. Whether depicting the clothing in his day workers series or the geometric-patterned jerseys in these newest portraits, Sonsini’s works draw attention to the way clothing conveys identity. For the past 25 years Sonsini has met his prospective sitters, predominantly Hispanic men, on the streets of midtown Los Angeles in the areas neighboring his Westlake studio. Using a characteristically expressive painterly technique, and a palette of earthy pastel tones reminiscent of the terrain and light of Southern California, Sonsini paints each portrait directly from life—daily sittings with a model typically lasting five hours. Sonsini conveys the immediacy of this exchange through rapid, near abstract paint handling and bold, straightforward compositions in which the sitter appears to gaze at the viewer. In each work, the artist evokes the physical and psychological presence of his model. Sonsini began painting from life during the mid-1980′s when he worked alongside legendary physique photographer Bob Mizer at Mizer’s Athletic Model Guild (AMG) Studios. Sonsini painted backdrops for Mizer’s AMG photo sessions, through which models were available to the painter on a daily basis. In the mid-1990′s Sonsini painted an ongoing series of portraits of his partner, Gabriel Barajas. 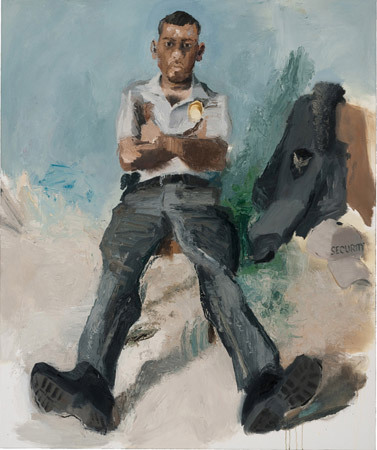 Starting in the early 2000′s Sonsini began his much renowned series of paintings of day workers, meeting his sitters at various street corners (or Home Depot parking lots) where men gather each day looking for work. Paying each sitter an hourly wage for the work of posing, Sonsini found sitters that could meet the practical demands of painting from life, namely individuals who were available daily to model. New Paintings presents portraits of several models the artist has painted previously, as well as new individuals introduced by regular sitters and friends. Sonsini approaches each painting as a conversation between painter and sitter. The posture and attire are mutually agreed upon, with Sonsini determining everything on the painted side of the canvas. Likewise, the recent prevalence of athletic clothing began with the suggestion of one model to be painted in his recreational soccer gear. The ancillary result is a contrast between representations of labor (including painting and posing) and leisure. The two canvases titled Roger (both 2011), for instance, portray the same model dressed in his security guard and fútbol uniforms. Considered alongside works like Christian and Alex, 2010 and Byron, 2009, in which the eponymous models are depicted with luggage, these new works further suggest the Los Angeles narrative of at least imagining, if not making oneself anew in the Western U.S. metropolis. The paintings on view range from headshots to ¾ figure frontal views, to full depictions of individuals and paired sitters. Every canvas shares Sonsini’s practiced compositional strategies—shallow depth of field, exaggerated extremities, edges that tightly crop each figure, and dimensions similar to 4 x 5 format photography—which in many ways can be traced to the early influence of Mizer’s wide-angle lens work. Combined with actively brushed and often brightly hued backgrounds, the effect, as the artist describes, is to have the entire composition “arrive at the same time.” Rather than privilege any part or element in a painting, Sonsini imbues even the most banal patch of background, clothing, or flesh with considered mark-making. Such lush detail evinces the complex painterly decisions the artist makes in getting from one part of a painting to another. The subsequent dynamic interplay between surface and image heightens the act of looking—replaying, for the viewer, Sonsini’s generous attention and the charged visual relationship between sitter and painter. John Sonsini was born in Rome, NY in 1950, and earned a B.A. from California State University Northridge, CA in 1975. He has exhibited his paintings extensively for the past thirty years, including recent solo exhibitions at ACME. Los Angeles, CA (2010, 2008, 2006); the Nora Eccles Harrison Museum of Art, Utah State University, Logan, UT (2010); Atkinson Gallery, Santa Barbara City College, Santa Barbara, CA (2007); Cheim & Read, New York, NY (2007); and the Museum of Contemporary Art, San Diego, CA (2005). His work is included in several prominent public collections including the Solomon R. Guggenheim Museum, NY; the Whitney Museum of American Art, NY; the Hammer Museum, Los Angeles, CA; the Museum of Contemporary Art, Los Angeles, CA; and the San Francisco Museum of Modern Art, San Francisco, CA. Sonsini lives and works in Los Angeles, CA. Photography Robert Wedermeyer, Los Angeles.